Happy casual friday - and halfway point of my 30x30 remix! If you're just joining us, I've committed to wearing only 30 pieces for 30 days (you can catch up here). So today's ensemble was meant to be laid back and cool, which is why I opted for stripes and leather. And four inch heels, which are clearly the epitome of "casual". Whatever, sometimes I put on flats and get so bored I fall asleep. It was a house to car to destination kind of day, so I didn't mind wearing killer heels because I wasn't planning on being on my feet. Leather/knit Jacket, ASOS (exact, on sale). Striped tee, The Limited (CUTE similar I'm considering from Michael Kors...I have an addiction). Navy Bag, JustFab (cute navy tote from Dorthy Perkins). Purple Heels, JustFab (similar from Steve Madden). 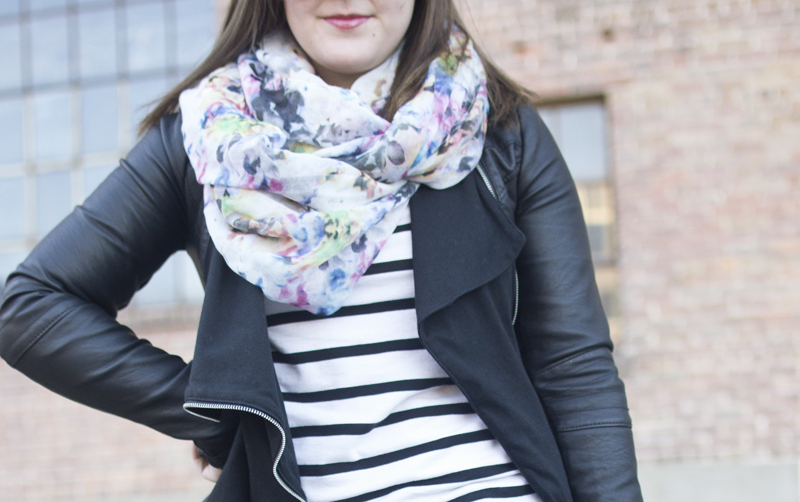 Watercolor Scarf, Charlotte Russe (similar from Kohl's in four colors! ).